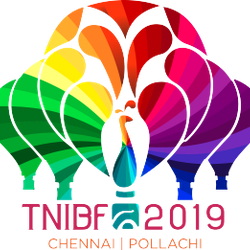 Start Date: Jan. 14, 2019, 6 a.m.
End Date: Jan. 14, 2019, 6:30 a.m.
Venue: TNIBF, Sakthi Mills Ground, Pollachi, Tamilnadu. Sponsor Ride Pass is allowed only for ONE ADULT (OR) ONE CHILD with VALID Original ID given during sponsor booking. Allocation of Balloons will be done by organiser on the date of the balloon ride. Sponsor Pass holder need to be at the venue Sakthi Mills Ground, Pollachi by 6 am. For Location info call +91 95000 90850. Verification with your ID proof will be validated before entry to launch field. Every sponsors pass ride are required to bring the print out of the Transaction ID and original ID without original ID you will not be allowed to board. Balloon Ride flight duration depend on that day’s weather conditions, generally balloon rides will be minimum 35 mins to maximum 1hr 20mins. Each Balloon ride flight timing may vary depend on the weather conditions, so the pilots decision is final . If there is any cancellations due to Rain, heavy wind and other natural calamities the rides will be cancelled on Pilot’s decision on that particular day only. In such cases we will refund the amount to your bank account within 7 days, there will not be any slots allocated for next day or next slot. Only If any slots available for next day it can be allocated with mutual understanding. Hot Air Balloon rides are totally weather dependent so we have no control on the nature or weather, so cancellation of flights will occur due to safety precautions. So if any such cancellations the organizer / Pilot / Staffs of TNIBF, will not be responsible for any other extra expenses made by you to reach the festival, only the sponsor booking cost will be refunded. Dates and timing need to be followed strictly, you need to be on ground not later than 6:00 am on the slot date allocated for you. In-case, if you miss the date or allocated timing there will be No Refund.